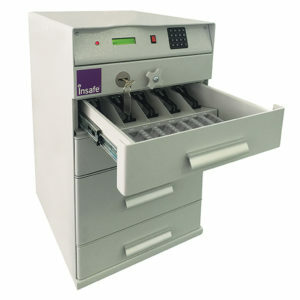 The Insafe Bankers Till Drawers (BTD) is an anti-attack device specifically produced for securing money deposits and withdrawals as well as stamps, cheques, etc. Programmable Drawers with Time Delay. The Bankers Till Drawer safe has a mechanical lock for overnight use plus each drawer can be individually programmed with a cashier code and an optional time delay for user security. 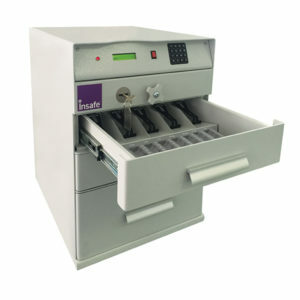 Drawers can also be programmed to be opened in ‘slot mode’ to allow insertion of banknotes without exposing the contents of the drawer. The BTD safe records 1000 events independently of the supply voltage. As an additional security measure the BTD can be connected to an existing building alarm system.